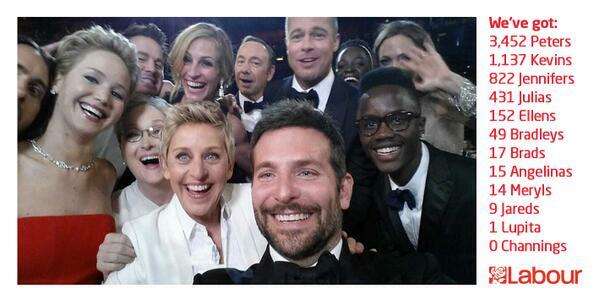 At the Oscar ceremonies 2014 Ellen DeGeneres made social media history by tweeting the most retweeted image of all time – that has since been dubbed #oscarselfie – overtaking the previous record holder Barack Obama. Keen to capitalise on the social media storm around the image, the UK Labour Party have released the number of supporters they have on record with names corresponding to celebrities featured in the image. The copy that accompanied the image on Twitter appealed for Labour sympathisers to join the party ranks and particularly encouraged anyone called Channing. It’s a nice piece of content that shows that the Labour Party can have a little fun. Most people don’t want to sign up to a worthy, earnest organisation that takes itself too seriously, so this sort of thing is the perfect antidote to such negative perceptions. If only Benedict Cumberbatch had spent less time photobombing U2 and more time using his sharp elbows to get into DeGeneres snap I might have been able to feature in the rankings.